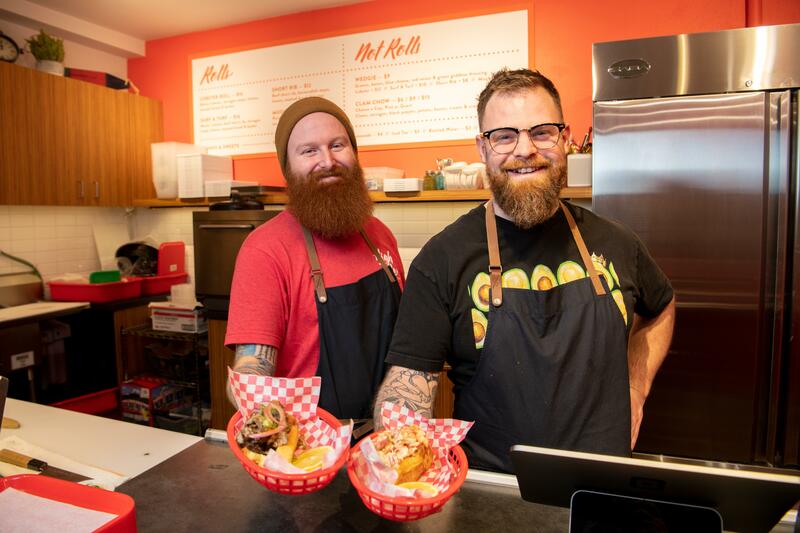 Mon., March 11, 2019, 5 p.m.
Spokane celebrity chef Chad White’s New England-style, fast-casual lobster bar, High Tide, has been open for about two weeks, and it’s generating so much buzz with the downtown lunch crowd that customers are lining up before the restaurant opens. “The line doesn’t stop until we sell out,” White said, adding the restaurant sells about one lobster roll per minute. High Tide opened Feb. 27 and in its first four days sold out of lobster, which is shipped from the East Coast. On the restaurant’s opening day, it sold more than 250 lobster rolls in just a few hours. “It was at the point where we were overnighting product to keep up with the flow,” White said. White said he’s taking steps to ensure lobster is stocked at High Tide by securing a local purveyor to deliver it daily to the restaurant. He’s also working with the Numerica building management to obtain more storage and refrigeration space for the small restaurant. The more than 386-square-foot walk-up lobster bar is on the second floor of the Numerica building at 502 W. Riverside Ave., Suite 204 – across from Edward Lalone Travel. High Tide features a menu with Maine lobster rolls ($16), braised short rib rolls ($12), surf-and-turf rolls with a combination of lobster and braised short rib ($14) and a mushroom roll ($10). The restaurant also serves salads and clam chowder. The restaurant’s “top seller 10 to 1” is its lobster roll, White said. “We are also selling quite a bit of salads, which is really great,” he said, adding customers are returning to try other items, such as the short rib roll. Chad White said High Tide’s early success definitely exceeded expectations and the restaurant’s location – in the hub of everything – has been a contributing factor in driving business. Downtown Spokane Partnership CEO Mark Richard said more than 72 new businesses opened in downtown Spokane last year and a handful of them opened in Skywalk. White, a former contestant on Bravo’s “Top Chef,” came up with the concept for High Tide after high demand for lobster menu specials at Zona Blanca, a walk-up ceviche counter he founded in 2016. “We would sell out within hours of advertising it,” he said. White said he’s more fond of fast casual, service-style restaurant concepts because a smaller menu allows for more attention to detail and protects the quality of the food. Published: March 11, 2019, 5 p.m.